It's that time of year - the unofficial start of the unofficial holiday "Butterfest", that period from October 31st to January 1st. Seems like starting with our wickedly wonderful tradition of begging for treats, comes a landslide of temptations and an overload of sugar and fat. How DO you manage to enjoy but not overdue, especially with candy? 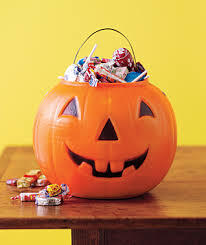 Weight Watchers has some great suggestions: *Buy late and don't open the bag until Halloween night, less temptation. *Choose candy you.